Lake Medical Imaging is now offering a groundbreaking new test for diagnosis of recurring prostate cancer. 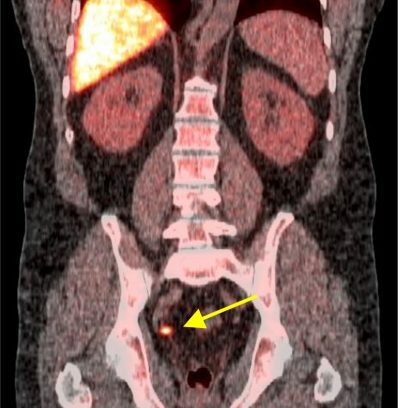 Axumin™ (fluciclovine F 18) is a diagnostic agent used to enhance PET (Positron Emission Tomography) imaging in men who have suspected prostate cancer recurrence based on elevated PSA (prostate specific antigen) levels following treatment. Image courtesy of Blue Earth Diagnostics, Inc. In two independent blinded studies, radiologists compared 105 Axumin scans to histopathology (the study of tissue changes caused by the disease) obtained by biopsy. On average, the radiologists correctly detected and localized recurrent prostate cancer in 77% of the images. For approximately one-third of images outside the region of the prostate bed, the study identified positive findings in an average of 90% of the images. Traditionally, such positive findings occur in less than 11% of patients scanned with conventional imaging, such as CT, MRI or bone scans. In the U.S., prostate cancer is the second leading cause of cancer death in men. In patients with suspected cancer recurrence after primary treatment, accurate staging is paramount in improving disease management as well as outcomes.